Brayden Tyler "Brady" Quinn (born October 27, 1984) is a former American football quarterback and current college football and NFL game analyst for Fox Sports. He played college football at Notre Dame and was drafted by the Cleveland Browns in the first round of the 2007 NFL Draft. Quinn also played for the Denver Broncos, Kansas City Chiefs, New York Jets and St. Louis Rams. Quinn was born on October 27, 1984, in Columbus, Ohio, the middle child of Tyrone J. Quinn and Robin D. (née Slates) Quinn. He has an older sister, Laura Quinn, who is the wife of former NFL and Ohio State linebacker A. J. Hawk,and a younger sister, Kelly Katherine Quinn, who is married to NHL defenseman Jack Johnson. Quinn attended Dublin Coffman High School in Dublin, Ohio, and ranked sixth on the Detroit Free Press "Best of the Midwest" team and was listed at number 20 on ESPN's list of the nation's top 100 prospects. As a junior in 2001, Quinn threw for 2,200 yards and 21 touchdowns to go along with 15 interceptions, posting a 9–4 record and helped lead Coffman to the Division I state semi-finals. As a senior in 2002, he threw for 2,149 yards, threw 25 touchdowns with four interceptions, and completed 143 of 258 pass attempts, and rushed for 108 yards and six touchdowns. Quinn helped his team post an 8–3 record and played in the U.S. Army All-American Bowl in San Antonio, Texas. Quinn was named the Columbus Dispatch and Ohio Capital Conference Offensive Player of the Year and was an All-State choice. Quinn was named an All-Conference player in baseball as a junior and lettered three times and was a part of the 2001 State Championship team. He was a member of Young Life, the Rock Solid Club, and Who's Who Among America High School Students. In the fall of 2002, received a scholarship from Notre Dame, acting on a tip from fellow recruit Chinedum Ndukwe's father. Quinn accepted the offer to attend Notre Dame, where he set 36 Fighting Irish records during his four seasons with the team. There were ten career records, twelve single-season records, four single-game records and ten miscellaneous records broken by Quinn throughout those four years, including the record for career pass attempts with 1,602; completions with 929; yards-per-game with 239.6; touchdown passes with 95, and the Irish's lowest interception percentage with 2.43. Quinn won 29 games as a starter at Notre Dame, tied with Ron Powlus and Tom Clements for the most in school history. In 2005, under Notre Dame's new head coach Charlie Weis, Quinn excelled as a starting quarterback, averaging 110 more passing yards per game than he had as a sophomore while increasing his number of touchdown passes from 17 in 2004 to 32 in 2005. Quinn was named to the 2005 AP All-America Team as a third-team quarterback and the 2006 SI.com All-American Team as a second-team quarterback. Quinn received the Sammy Baugh Trophy as the nation's top passer of the 2005 season. At the end of the season, Notre Dame faced Ohio State in the Fiesta Bowl. Quinn had 29 completions in 45 pass attempts for 286 yards in a 34–20 loss to Ohio State. Prior to the start of the 2006 college football season, Quinn was featured in a regional cover on the August 22, 2006 issue of Sports Illustrated's 2006 College Football Preview issue along with then-teammates Tom Zbikowski and Travis Thomas with the caption "Notre Dame: The Battle For No. 1." Quinn finished the season with 3,426 yards on 289 completions out of 467 attempts for a completion percentage of 61.9% and 7.34 yards per attempt. He threw 37 touchdowns to only 7 interceptions, and was sacked 31 times. Quinn finished the regular season with a passing efficiency rating of 146.65, which ranked him 18th in the country. Notre Dame invited to the 2007 Sugar Bowl on January 3, 2007, where they played LSU. Quinn was held to 148 passing yards. Quinn threw two touchdown passes, both in the first half, and LSU held Notre Dame scoreless through the second half of the game to defeat the Fighting Irish 41–14. Following the 2006 season, Quinn won several awards, including the Johnny Unitas Golden Arm Award for the best college quarterback in the nation and the Maxwell Award for the best college football player. . He was named the Cingular All-America Player of the Year and was named to the 2006 AP All-America Team as a second-team quarterback. Quinn graduated from Notre Dame with dual degrees in political science and finance. Coming into the draft Quinn was considered to be one of the top players in the country, and was invited to the draft. Before the draft started, Quinn was labeled as a "franchise quarterback in the mold of Carson Palmer." He was projected to be picked in the top ten and even could have been the number one overall pick. While some suspected the Cleveland Browns would select Quinn with the third pick, he fell to the 22nd pick in the draft before being picked up by Browns. Following the draft, Quinn was criticized by fellow Notre Dame quarterback Joe Theismann in a radio interview, claiming that Quinn looked "unprofessional" when he was on stage following his name being called. Theismann was bothered by the appearance of Quinn's hair and the fact that he was chewing gum. Quinn responded, saying, "I apologize to anyone, obviously, who is a Notre Dame alum, or for those fans who thought I wasn't being very business like. I was there for awhile, and at that moment in time, when you finally get picked after waiting for 4 1/2 hours, the last thought in my head was spit out your gum, fix your hair or make sure your shirt and everything looked good. I was just trying to get on stage as fast as possible and get that Browns jersey in my hand." Quinn signed a five-year deal with the Browns worth a reported $20.2 million, with $7.5 million guaranteed and up to $30 million in incentives. Quinn was originally placed third on the Browns' depth chart behind Charlie Frye and Derek Anderson. However, after a 34–7 defeat to the Pittsburgh Steelers in Week 1, Frye was traded to the Seattle Seahawks for a sixth round draft pick, moving Quinn to second on the Browns' depth chart. On December 30, 2007, when Anderson hurt his pinky and wrist, Quinn made his official NFL debut in the Browns' final game of the season against the San Francisco 49ers. Going 3 for 8 passing, Quinn led the Browns to the redzone, but failed to score. Despite speculation that the Browns would trade Anderson to get back into the first round of the 2008 NFL Draft, Browns' general manager Phil Savage later stated that he hoped to sign Anderson, and keep both quarterbacks for the 2008 season. After leading the Browns to a 10-6 record, Derek Anderson was named the starting quarterback for the 2008 season, leaving Quinn on the sidelines once again. However, after a mediocre 3–5 start by the team, head coach Romeo Crennel named Quinn the starting quarterback for the Browns' upcoming game against the Denver Broncos. Though he played well, and helped the Browns build a two-touchdown lead into the third quarter, the Broncos rallied back to win, causing Quinn's first official start to end in a loss. However, he went on to win the next game against the Buffalo Bills, but he broke his finger during this victory, and though he tried to play through it during the next game against the Houston Texans, he announced on November 25 that he would have surgery, sidelining him for the rest of the 2008 season. Soon after the season was over, Romeo Crennel was fired as head coach and was replaced by former New York Jets coach Eric Mangini, who was unsure of who would be the Browns's starting quarterback. Thus, a competition for the starting job between Quinn and Anderson occurred throughout the offseason. Four days before the Browns's 2009 opener, it was announced that Quinn would be the starter. Quinn continued to be the Browns' starter until Game 3 against the Baltimore Ravens, when he was benched at halftime in favor of Anderson. The following week, Mangini named Anderson the starter. Quinn did not play again until Week 8, when he was brought in with three minutes to go in a 30–6 loss against the Chicago Bears. As the Browns headed into their bye week, it was not indicated who would be the starting quarterback for the rest of the season. However, it was announced five days before their Week 10 Monday Night Football game against the Baltimore Ravens, that Quinn was once again being awarded the starting quarterback position. Though he struggled in his first game back, as the Browns were shut out 16–0, Quinn followed it up in Week 11 with his best professional outing yet, throwing for 304 yards with 4 touchdowns against the Detroit Lions. Quinn set a record for the Cleveland Browns that day being the only QB in franchise history to throw 3 touchdowns in one quarter. The Browns later defeated the rival Pittsburgh Steelers, Quinn's first win of 2009 as the starting quarterback. The next week the Browns defeated the Kansas City Chiefs 41–34, despite Quinn injuring his foot during the game. On December 22, the Browns placed Quinn on Injured Reserve for the last 2 games of the season with a "Lisfranc" foot injury. On March 14, 2010, Quinn was traded to the Denver Broncos in exchange for Peyton Hillis, a 6th round pick in the 2011 NFL Draft, and a conditional late-round pick in the 2012 NFL Draft. Quinn competed against Broncos incumbent Kyle Orton for the starting job. He began the regular season second on the depth chart, behind Orton, and did not play in any game in 2010. In August 2011, Quinn was placed second on the depth chart, behind Orton for a single game against the Buffalo Bills in the preseason. In Week 5, Tim Tebow entered the game against the San Diego Chargers at half time in place of Orton, and Tebow started every remaining Broncos game, with Quinn remaining on the bench. In two seasons with the Broncos, Quinn did not play in any games. Quinn signed with the Kansas City Chiefs on March 17, 2012. After competing for a backup quarterback spot, Quinn beat Ricky Stanzi for the spot and it was official on August 27, 2012. He then made his Kansas City debut against the Baltimore Ravens on October 7, 2012 after Matt Cassel suffered a concussion. On October 11, Cassel was ruled out for Week 6 game against the Tampa Bay Buccaneers, and Quinn got his first start as a Chief. Following that game, Quinn was announced as the starter by head coach Romeo Crennel for the October 28, 2012 game against the Oakland Raiders. After playing less than a quarter, Quinn left that game with a concussion. Cassel returned to the game and started the games following. However Quinn replaced Cassel at half in the November 15 game against Cincinnati and was awarded the starting job once again. A day after the murder-suicide by linebacker Jovan Belcher, Quinn played arguably his best game as a starter in an emotional 27-21 win over the Carolina Panthers on December 3, completing 19-23 passes for 201 yards and two touchdowns. Quinn was chosen as the AFC Offensive Player of the Week following the game. He also received media attention for his eloquent comments about the circumstances following the game. On April 11, 2013, Quinn signed with the Seattle Seahawks as the backup quarterback to Russell Wilson. He was released on August 31, 2013, during final roster cuts. Quinn had battled all preseason with Tarvaris Jackson for the backup job. Quinn was signed by the New York Jets on September 2, 2013, but was released five days later. He was re-signed on September 9, 2013. Quinn was released to make room for David Garrard on October 21, 2013. Quinn was signed by the Rams on October 23, 2013, to back-up Kellen Clemens after starter Sam Bradford suffered a torn ACL. Quinn injured his back in the weight room the second week he was with the team and would never see the field. Quinn was placed on IR for the final four weeks of the 2013 season. Quinn had initially not planned to play during the 2014 season and signed on to be a rotating color commentator for the NFL on Fox, but his contract featured a clause that allowed him to leave to play in the NFL. Quinn signed with the Miami Dolphins on August 11, 2014, just a few days after signing his television contract. The Dolphins released Quinn on August 26, 2014. After not playing football for a year, Quinn participated in the first NFL Veteran Combine in 2015. Quinn began dating USA Olympic gymnast Alicia Sacramone in 2009. They announced their engagement in August 2013 and were married in March 2014. The couple has two daughters together. Quinn founded a charity, 3rd and Goal - Veterans Home Aid, in 2011. The foundation's mission aims to make homes handicap accessible for wounded veterans. He and his wife are co-chairs of the foundation. ^ Strauss, Chris (July 31, 2014). "Brady Quinn joins FOX Sports as NFL and college football analyst". USA Today. Gannett. Retrieved July 31, 2014. ^ Schwab, Frank (July 31, 2014). "Former Browns bust Brady Quinn gives up playing for broadcast booth". Yahoo! Sports. Yahoo!. Retrieved July 31, 2014. ^ a b c "Cleveland Browns – Players – Brady Quinn". Archived from the original on September 27, 2007. Retrieved May 10, 2007. ^ Eric Hansen (July 6, 2006). "American dream, Part II: Ndukwe's children carry parents' goals". southbendtribune.com. South Bend Tribune. ^ "Young, Bush headline AP All-America team". Retrieved May 10, 2007. ^ "2006 Sports Illustrated All-American Team". Retrieved May 10, 2007. ^ "Touchdown Club Awards – Sammy Baugh Trophy Recipients". Archived from the original on October 16, 2007. Retrieved May 10, 2007. ^ "The Tostitos Fiesta Bowl: BCS Bowl Game". Fiesta Bowl. Archived from the original on July 20, 2011. Retrieved October 13, 2012. ^ "Sports Illustrated Covers – August 22, 2006". Sports Illustrated. Archived from the original on February 21, 2007. Retrieved May 10, 2007. ^ "Brady Quinn Career Stats". Retrieved May 10, 2007. ^ "NCAA Division-I Passing Leaders". Retrieved May 10, 2007. ^ "Notre Dame Fighting Irish at LSU Tigers". Retrieved May 10, 2007. ^ "Past Winners". The Golden Arm Foundation. Archived from the original on December 16, 2007. Retrieved January 2, 2008. ^ "Maxwell Award: College Football Player of the Year". Archived from the original on June 22, 2007. Retrieved May 10, 2007. ^ "Ohio State's Smith Wins 2006 Heisman In A Landslide". Archived from the original on February 27, 2007. Retrieved May 13, 2007. ^ "Brady Quinn Selected as Cingular All-America Player of the Year". University of Notre Dame. January 9, 2007. Retrieved January 2, 2008. ^ "2006 AP All-America Team". Retrieved May 10, 2007. ^ Sandy Mitchell (May 16, 2007). "Profile of Cleveland Browns Quarterback Brady Quinn". ^ "Brady Quinn". nfldraftscout.com. Retrieved September 3, 2016. ^ "Brady Quinn Scouting Report". Archived from the original on May 10, 2007. Retrieved May 10, 2007. ^ "ESPN.com's 2007 mock draft". Retrieved May 10, 2007. ^ "SportsNation NFL Mock Draft". Retrieved May 10, 2007. ^ "2007 Mock Draft". Retrieved May 10, 2007. ^ "Browns trade up, get Quinn". Archived from the original on October 8, 2007. Retrieved May 10, 2007. ^ Withers, Tom (May 4, 2007). "All eyes on Brady at Browns mini-camp". www.washingtonpost.com. Retrieved July 26, 2016. ^ "Quinn, Browns agree on five year, $20M contract". Retrieved August 7, 2007. ^ "Browns deal quarterback Frye to Seahawks for draft pick". ESPN. September 11, 2007. Retrieved September 12, 2007. ^ "NFL News, Videos, Scores, Teams, Standings, Stats". Fox Sports. Archived from the original on December 4, 2008. Retrieved October 13, 2012. ^ Ridenour, Marla (December 23, 2009). "Injured Quinn is done for year". Akron Beacon Journal. Retrieved December 25, 2009. ^ "Chiefs sign veteran Winston, backup QB Quinn". ^ "Brady Quinn starts at QB for Chiefs, Buccaneers expect him to rely on strong running game". Fox News. Retrieved October 13, 2012. ^ "Cassel, Quinn face off in Kansas City". ESPN. Retrieved October 22, 2012. ^ "Brady Quinn out for Kansas City Chiefs with injury". NFL.com. October 28, 2012. Retrieved November 20, 2012. ^ Mike KlisThe Denver Postdenverpost.com (September 14, 2010). "Former Broncos QB Brady Quinn may start vs. Denver for Chiefs". The Denver Post. Retrieved November 20, 2012. ^ "Seahawks settle on Brady Quinn". April 9, 2013. ^ Allen, Eric (September 7, 2013). "Quinn Released, Lansanah Signed from P-Squad". New York Jets. Retrieved September 7, 2013. ^ "Jets bring back QB Brady Quinn". Associated Press. September 9, 2013. Archived from the original on September 10, 2013. Retrieved September 9, 2013. ^ Allen, Eric (October 21, 2013). "David Garrard Activated, Brady Quinn Released". New York Jets. Archived from the original on October 21, 2013. Retrieved October 21, 2013. ^ Wilson, Aaron (October 23, 2013). "Rams signing Brady Quinn, Austin Davis". National Football Post. Archived from the original on October 24, 2013. Retrieved October 23, 2013. ^ Lombardo, Matt (August 6, 2014). Former Eagles quarterback Donovan McNabb to call NFL games this season. NJ.com. Retrieved August 6, 2014. ^ Sessler, Marc (August 11, 2014). "Brady Quinn signed by Miami Dolphins". NFL.com. Retrieved August 11, 2014. ^ "Brady Quinn among players waived by Miami Dolphins". Palm Beach Post. ^ "NFL to host inaugural Veteran Combine". NFL.com. March 11, 2015. Retrieved March 22, 2015. ^ "Brady Quinn marries gymnast Alicia Sacramone - FOX Sports". March 10, 2014. ^ "Alicia Sacramone and Brady Quinn Welcome Daughter Sloan Scott". 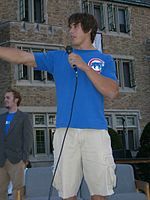 Wikimedia Commons has media related to Brady Quinn.